The view of the Pacific Ocean from the end of the trail. Catalina Island is visible on the horizon. A collective “Wow” was audible over the clamoring of the kids to get to the edge of the rock and fully take in the expanse of ocean that glistened below. After a hike up and down hills and through a field of tall grass, the ocean below sparkled like a blue cloth covered in diamonds. For the 40 kindergarteners and pre-kindergarteners, it was a race to get to the top of the rocky outcrop that was perched atop the grand view of the ocean. 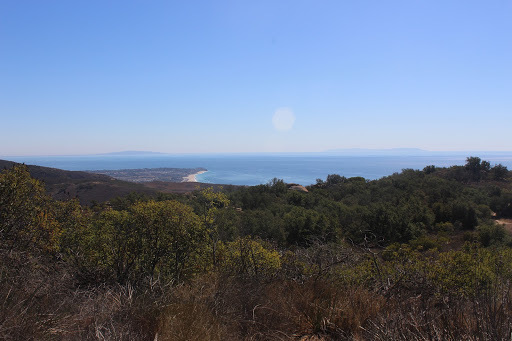 This day’s trip to Charmlee Wilderness Park in Malibu was with West Vernon Elementary School in Los Angeles. After the bus sputtered through the thick of Los Angeles traffic on the interstates, we traced along the ocean for the last half of our drive. The kids pressed their faces and hands against the glass, trying to sneak a peek at the water through the trees as the bus chugged along. Surprisingly, despite growing up in Los Angeles, the children rarely see the ocean that the city is known for. Eventually the bus turned off the Pacific highway eventually arriving at the Charmlee Wilderness Park. A modest view of the shore could be seen from the parking lot, but the leader of the hike, Bob Baldwin, promised an even more spectacular view to come after a short hike. But that would come after lunch. During lunch, a few of the boys in kindergarten started to notice the pinecones. The pinecones there were tough to miss, bigger than a baseball and sprawled on a bed of decaying pine needles. After initially throwing them at each other (as kindergarten boys who come across baseball-size pinecones instinctively do), the boys began to collect them and compare their sizes and feel. The boys intensely studied the features of these pinecones using their senses, feeling all around the outside of the spiky pine cones and bringing them up to their eyes to inspect these strange things that had fallen from the trees. On these hikes, outside of the grand views experienced at the end, sometimes the greatest joys can be found in the small things, whether it be a rabbit darting into the brush or a hawk soaring overhead, or even some thing that so many people take for granted, like a really big pinecone. 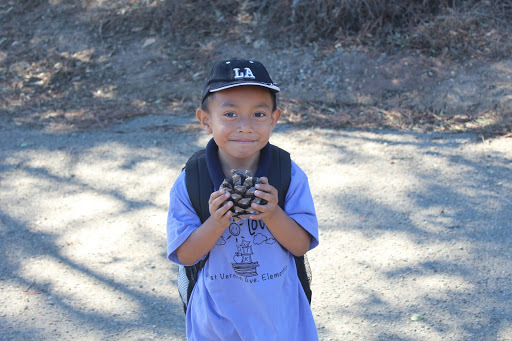 A young ICO participant admiring one of the giant pine cones that populate Charmlee Wilderness. After lunch, Bob and co-leader Ron led the students on a short hike. Bob and Ron are both experienced ICO leaders, spreading their love of nature with kids all over Los Angeles. Ron, who was the sweep for the group making sure no one was left behind, shared how spectacular this field was in the spring and early summer when wildflowers bloomed and the tall grass was green. On this day in late October, the grass was a tawny shade of brown as we followed along the path that led onto the spectacular view Bob had promised. At the edge of the field was an old, dilapidated water spout from a century earlier marked the turning point out into the rocky outcrop overlooking the magnificent ocean view we had been promised. The kids, who had began to feel tired after the long hike, were exhilarated by the view and scrambled on top of the rock. Bob showed them a huge, castle-like house below right by the ocean. He told the kids that it looked like the castle from Frozen, the movie, and they anxiously glanced down toward the ocean.